I don’t know when you’re reading this, whether it’s 20 degrees outside or 80, whether the snow is falling as it gets dark at four in the afternoon or if the sun is still shining until 9 o’clock at night as you drink margaritas on the beach. Heavens knows I’m not writing this in December at any rate. It’s being posted in early August, but since the reviews stay in the archives forever after anybody can stumble across this at any point during the year, summer OR winter or any point in between. Regardless, this marks another important first here in the history of rock ‘n’ roll, and another for The Ravens in that regard as well, as this is the very first Christmas record released by a rock artist, something that in the eyes of many meant this unwelcome intruder on the national music scene had now corrupted a sacred holiday in addition to the litany of prior offenses against humanity, moral high standards and common decency. I agree… all of that IS something to celebrate, isn’t it? So whatever day is on your calendar as we speak… Merry Christmas! Just make sure to leave your presents for me under the tree. 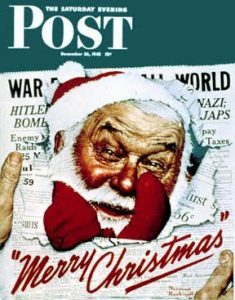 The overwhelming majority of Christmas “standards” we still know so well today were introduced over a surprisingly brief time, from the mid-1930’s to the early 1950’s, centered largely around the corresponding events and sentiments of World War Two. A cursory scan of the lyrics to many of these songs reflect the utterly unique context of that era, with recurring themes of yearning for loved ones far away and the sad, but resilient hope appearing often in songs such as I’ll Be Home For Christmas (1943), or just an overall tint of melancholy wistfulness in The Christmas Song and Have Yourself A Merry Little Christmas (both 1944), which remain among the most beloved seasonal offerings more than 75 years later by people who never experienced the loss and constant fears of living through a World War. This a notable difference from the songs bookending those years which remain equally popular today (Winter Wonderland and Santa Claus Is Coming To Town – both 1934, and Sleigh Ride from 1948, and the enduring cartoon characters of Rudolph The Red Nosed Reindeer and Frosty The Snowman which soon followed) which are more buoyant and lighthearted by nature. It’s largely the specific circumstances of when all of these songs were written, impossible to truly replicate, that gives the music which defines the holiday its unique texture and what is often missing from most of the Christmas music that’s followed in the seventy some odd years since. Christmas songs of more recent vintage somehow seem less durable and frankly even more dated than the older material because the peripheral circumstances from the war years and surrounding landscape gave those war-tinged songs far more human resonance. Because those songs from that unique era were subsequently played each and every year since they’ve retained their familiarity to anyone who’s come of age since then, and thus it’s become THOSE sentiments expressed about THAT specific time in our history long since passed that have colored everyone’s idea of Christmas (and the music that accompanies it) ever since. In other words because the songs have become timeless so too have the sentiments and underlying moods associated with that music. Two songs in particular serve to illustrate the point of departure in views that was served up in the music entering and exiting World War Two. The relief brought on by end of the war is evident in the absolutely joyous declaration Let It Snow! Let It Snow! Let It Snow!, released in 1945 as the nation collectively let its breath out and collapsed with giddy exhaustion. There’s nothing ABOUT the end of hostilities in the lyrics, but the mood absolutely reflects the euphoria that everyone was feeling now that the fight was won and the boys were back home. But let’s go back to 1940/1941 when Europe was engulfed in a war the Allies were most decidedly losing at the time and were thought by many to be on the brink of utter destruction to find the song which marked the beginning of the nostalgic look back that forever gave Christmas music its unique combination of joy mixed with sadness. The most popular song – and best selling record – of all time, White Christmas was written by someone who did not even celebrate Christmas in the religious sense, Irving Berlin, a Russian born Jew who moved to America as a boy with his family in 1893 to escape persecution in their home country. His father, who had been a cantor (singer) in Russia, died in 1901 forcing Berlin to drop out of school and work where he made more singing on corners than selling papers on those same corners. Buoyed by the positive responses to his efforts he soon left home, learning his trade by singing – and writing music – in saloons. At twenty years old he became a star when his composition Alexander’s Ragtime Band started a national dance craze in 1913. It launched not just Berlin’s career as perhaps the greatest composer in modern history, but arguably marked the beginning of distinctly American styles of music, oddly enough since Berlin was not a native citizen. Over the next thirty years he proved his songwriting abilities knew no bounds, composing everything from heart-wrenching ballads (When I Lost You) to flag-waving patriotic anthems (God Bless America) to silly novelties and dance themed numbers. When the first motion picture with sound, (The Jazz Singer), debuted in 1927 it was Berlin’s Blue Skies which was sung by Al Jolson on the screen. Berlin also went on to write numerous musicals that topped the box-office for years to come, one of which was Holiday Inn, a 1942 movie starring singer/actor Bing Crosby, the greatest pre-rock vocal star and arguably still the most dominant ever in terms of how broad his popularity was in the context of his time. Though Crosby scored more chart hits than anyone (over 350, two hundred some odd more than Elvis Presley if you’re keeping score! ), most of those have been long since forgotten as that generation passed away and rock ‘n’ roll took over the hearts of subsequent generations. Today, the one Bing Crosby song that everybody, regardless of age or musical taste, knows full-well remains White Christmas, which seven decades later is still played to death for at least one month of the year. It’s a song that’s not so much a celebration of Christmas as much as it is a longing for what Christmas once was in a world not torn apart by war. Though the specific mention of war or anything current for that matter is not addressed directly in the lyrics, the nostalgic yearning behind it is palpable and connected with audiences in the midst of an unimaginable stretch of fear and uncertainty brought about by an epic global conflict they were being dragged into. It was written by Berlin sometime in 1940, a year after Germany invaded Poland which brought Great Britain into the battle, and was first performed by Crosby on radio on Christmas Day 1941, just two weeks after America itself entered World War Two when Pearl Harbor was bombed. Quite naturally it then quickly appeared in the musical Berlin wrote, the aforementioned Holiday Inn, which became a box office smash in 1942 and the record went on to win the Academy Award for best song. By that fall it was the most popular tune in America, topping the charts from October through January, 1943 and thanks to its recurring seasonal appeal it topped the charts again in both 1945 and 1946. The next year (1947) he re-recorded it (for better fidelity) and that’s become the record most heard in the years since. Amazingly Crosby’s versions of the song made the Pop Charts in twenty different seasons before Billboard essentially banned it from further entries by creating what can reasonably be called the White Christmas Rule which segregated Christmas songs to their own separate chart starting in 1963 (a policy that was rescinded in 2017). It’s a safe bet to say that virtually everyone who’s been alive since World War Two has heard him sing this song. Though the 1940’s were the era in which songs, rather than singers, were the focal point of the industry, with dozens of artists tackling the most popular tunes in competing versions, often with multiple acts scoring Top Ten hits simultaneously with the same song, Bing Crosby OWNED “White Christmas” in the public’s mind. Lots of others cut it of course, but only Frank Sinatra and Jo Stafford managed to score big with takes on it between Crosby’s release in 1942 and the moment when a group of rock singers known as The Ravens entered the studio to lay down their own version in 1948. Right away you sense something is different here. Christmas suddenly got a lot hipper. A group vocal intro spouting a wordless refrain leaves listeners who had an intimate familiarity of Crosby’s solemn take on it absolutely NO idea what this might be or where it was headed. The sudden appearance of Jimmy Ricks’s rolling bass voice that follows is every bit as alarming as it’d be to find out Santa Claus wasn’t a jolly fat man with whiskers leaving presents in your stockings, but rather a cat burglar who pilfered your silverware and when the lady of the house catches him in the act he flashes his smile (among other things!) which leads to her voluntarily removing her OWN stockings for a present of a different kind. Needless to say, it’s not the quaint holiday story you’ve come to know over the years. While the warm resonance of Ricks’s vocals backed by the impeccable harmonies of the others behind him lend some assurance to the startled masses that this is not a plot to overthrow the North Pole in the name of some godless communist regime, in every other way it’s nearly as threatening for those who huddled around the floor model radios next to the fireplace with their eggnog expecting to hear something as predictably safe and secure as Bing’s comforting lazy baritone crackling over the speakers. To start with there’s a very definite bounce to this version of White Christmas that was absent when der Bingle sang it. The stately melody of that version has been somewhat subverted by this introduction of rhythm to the proceedings, akin to when ladies bathing suits suddenly revealed the stomach with the introduction of the bikini. It may not SEEM like much now, but then it was downright scandalous, almost as if Ricks was mocking both Crosby and Berlin and the song itself in the process. When he adds a melodic twist to the second stanza (the first of quite a few interjections that certainly weren’t on the sheet music) it serves to completely upend the somber tone Crosby brought to it. By 1948 times had changed, the war was well in the past, the pessimism and uncertainty enveloping the world when the song was written and first sung had been replaced by confidence and boundless optimism. America had been the victors in that conflict, emerging from it with their stature and economic power higher than ever. The resulting mood of the nation as a whole was sky high and following previously unthinkable advancements in the way of wartime opportunity, the black community in particular were convinced that their status would rapidly improve in short order and they’d be welcomed by society to join in the communal celebration of being an American at long last. If so, they’d be ready to add a distinctive cultural flavor to the proceedings that the country surely needed. But cultural differences aside, The Ravens version unquestionably accentuated this brighter outlook of the post-war era regardless of the skin pigmentation of those listening. Crosby sang it like someone who was convinced that today’s Christmas and those still to come could never equal the memories of those from years gone by, when the world seemed smaller, safer and somehow more pure. Ricks on the other hand sang it knowing full well that the best was yet to come, that each Christmas offered new and wonderful opportunities to live up to those ideals the holiday promised and finally, perhaps, that every one of us was going to get to share in at last. One looks back, the other looks forward. When Maithe Marshall enters for the bridge, his high tenor sounding almost exaggeratingly feminine, the respective audiences probably came to blows under the mistletoe, with the old guard seeing it as an outright farce (probably not helped by The Ravens lightheartedly injecting a verse of “Jingle Bells” before the coda), while the new breed of rock fans listened with rapt attention and utter delight as this most venerable of songs was deconstructed before their very eyes to suit their own outlook and sensibilities for the first time in memory. If there was one thing both sides could agree upon after hearing this it’s that Christmas would never be the same again. When their version of White Christmas broke into the Top Ten on the race charts it confirmed The Ravens as the pre-eminent vocal group in rock, the ones who had the skill and confidence (not to mention the sheer audacity) to take anything, no matter how sacred to others, and make it distinctly their own. It showed that rock music wasn’t some easily dismissed novelty from the fringes of society but rather it was fast becoming the growing voice of a new era, one that would eventually have to be listened to and taken seriously by everybody. While others were dreaming of a white Christmas, The Ravens were turning that white Christmas black and doing so with pride and good cheer, which is what Christmas is all about after all. Crosby’s version remains the gold standard in the American songbook, deservingly revered as a pinnacle of control, nuance and sentimentality in the pre-war style of vocal delivery, a record that is every bit as good as its immense legend. But The Ravens radical re-interpretation is nearly as good, and arguably even more influential as it broke new ground for stylistic individuality in song and became the blueprint for many of the subsequent versions of the composition that followed, most notably in The Drifters 1954 take on it that became the second biggest selling version of “White Christmas” in history. 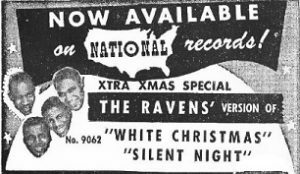 So while this will never reach the universal acclaim as Crosby’s take on it, The Ravens did more than merely deliver the first rock Christmas record to the public, they offered something truly distinctive in the process. Considering that for a month each year you only hear the same three dozen or so records ad nauseum to collectively set the mood of the season, surely there’s plenty of room for both versions under your tree. For whatever reason, I’ve always preferred listening to winter-holiday music during the summer. So, this review sits well with me. Anyway, this is a great recording. If the Drifters hadn’t recorded their excellent version (clearly based on the Ravens), the Ravens’ version would be the definitive rock-and-roll rendition. Leave a reply on "The Ravens: “White Christmas”"